Every step that occurs once the trash leaves your control has risk that someone will find personal information they can use to cause you harm. 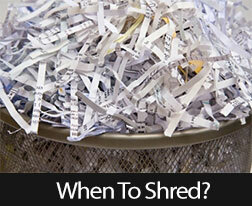 One way to safeguard personal information is to shred it before it goes into the trash. Shredding devices are available at most office supply stores. Cross-cut shredders provide more security than strip-cut shredders. You may want to consider one depending on your level of concern. Shredding services or shredding events are often offered by financial institutions or community organizations. Properly destroying sensitive personal information is a key step in helping to keep your identity secure. You really should shred any documents containing personal information, but be cautious not to shred financial documents that you may still need. Always shred documents with Social Security numbers, birth dates, PIN numbers or passwords, financial information, contracts or letters with signatures, pre-approved credit card applications, medical and dental bills, travel itineraries, and used airline tickets. This entry was posted in Personal Finance and tagged Personal Finance,Business Tips,Shredding Documents by BJ Kirkpatrick. Bookmark the permalink.